ItemCanning 055 - Locations on the Canning River by J.W. Gregory, later additions of roads [scale: 8 chains to an inch]. ItemCanning 056 - Locations on the Canning River by A.L. Preiss, later additions by J.W. Gregory 1842/3 and William Phelps 1858 [scale: 8 chains to an inch]. ItemCanning 057 - Locations on the Canning River. Sheet No. 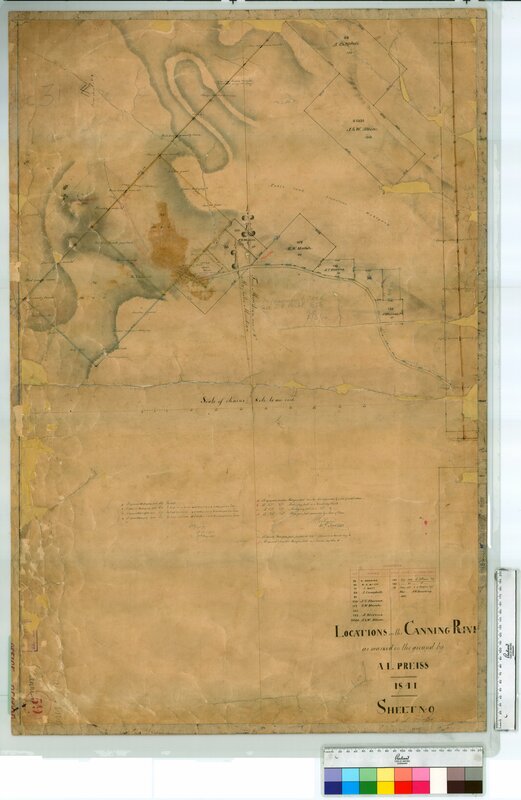 15A added to Preiss's Survey of Canning River by J.W. Gregory [scale: 8 chains to an inch]. ItemCanning 058 - Locations on the Canning River by J.W. Gregory, later addition of road [scale: 8 chains to an inch]. ItemCanning 059 - Locations on the Canning River by A.L. Preiss, later additions by Hillman 1846, A.C. Gregory, May 1850. J.S. Brooking, March 1882 [scale: 8 chains to an inch]. ItemCanning 062 - Locations on the Canning River by A.L. Preiss, later additions Lot 42 by P.W. Austin, 1858 and others by J.S. Brooking, 1879-1881 [scale: 8 chains to an inch]. ItemCanning 064 - Locations on the Canning River by A.L. Preiss (Sheet 12) [scale: 8 chains to an inch]. ItemCanning 065 - Locations on the Canning River by A.L. Preiss (Sheet 1) [scale: 8 chains to an inch, Tally No. 005654]. ItemCanning 066 - Locations on the Canning River by G. Smythe, W. of Guildford Road, Sheet 3 [scale: 8 chains to an inch]. Item Canning 059 - Locations on the Canning River by A.L. Preiss, later additions by Hillman 1846, A.C. Gregory, May 1850. J.S. Brooking, March 1882 [scale: 8 chains to an inch]. Locations on the Canning River by A.L. Preiss, later additions by Hillman 1846, A.C. Gregory, May 1850. J.S. Brooking, March 1882 [scale: 8 chains to an inch]. H Manning Loc 23; W.A. McCoy, 24; A Batt, 34; A Campbell 88 and 91; J.T. Stevens 116; E.W. Marsh 117 & 132; J Stevens 133; J & W Allen S1551. Confirm Item Request: Locations on the Canning River by A.L. Preiss, later additions by Hillman 1846, A.C. Gregory, May 1850. J.S. Brooking, March 1882 [scale: 8 chains to an inch].